This entry was posted in Friday Fictioneers and tagged Abuse, Rochelle Wisoff-Fields, Roger Bultot. Bookmark the permalink. Something deeply unsettling here! Well written story, Dale. Thank you, Susan. Outside of my usual, but that’s what we should do on occasion, right? I know! I went the Sci-fi route. Really? Such dark undertones, very cleverly done. Those bad memories are hard to shut down completely. Bad memories – can they ever completely be shut down? I don’t think they can. 😦 And my cleverness is questionable ha. You captured so much of the turmoil rattling around in today’s world. Nicely done. Wow. Sounds like a major violation. Nah… thankfully, fiction for me. It’s those moments of quiet, lying in bed, when those memories creep back in, good or bad. It didn’t kill her, so it made her stronger. But it’s impossible to completely forget. Powerful and oh-so-often true. Well done, Dale. We cannot always control what memory drags up from the deepest wells. We cannot undo what had taken place. All we can do is do our best to decide what we’d do WITH that stuff–the memories, the events, the things that shouldn’t have taken place yet had. Your piece lets it all be there. Nicely done. Thank you, Na’ama. No… those darn things pop up when you least expect them. And yes, it is up to us to decide how to deal with them. And no, I had no idea where this photo was taken. 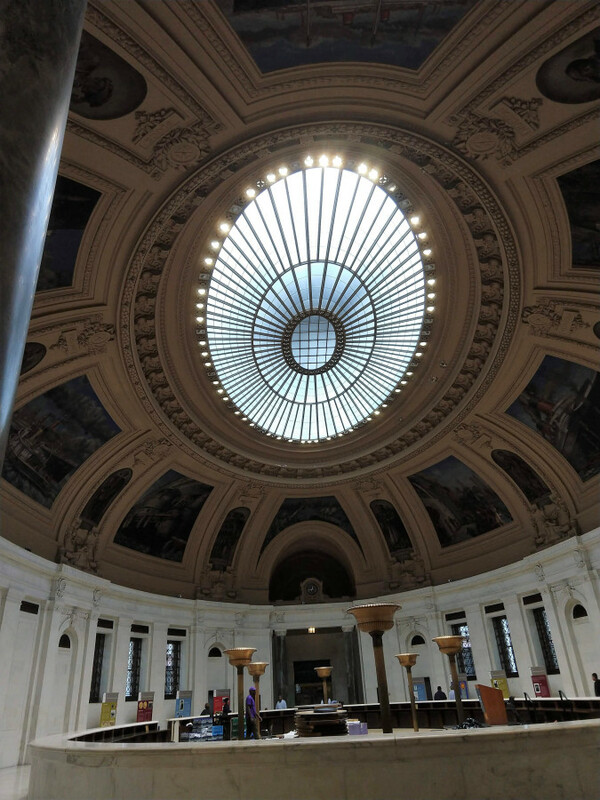 What is the NYC Custom House? Oh, it’s a pretty building! And the murals on the walls had given me the inspiration for my version of the prompt. it takes a lot of courage to face one’s demons. hopefully, she has reached that point in her life. I think there are a lot of women now going through this. Thank you, Merril. I never intended it to be a “Me too” but there you go! My interpretation then, but still. You used the ceiling in a different way than I imaged, plus the story took an unexpected turn at the end for me. Thumbs up! For the record, I’m prepping Act 11 at this moment. Like… you think I ain’t gonna be ready? Oh no because I know you will … just reporting my actions. Those memories do have a way of coming back to haunt. Glad this is fiction. ❤ Something a little different for you and very well done. They do indeed. And I didn’t specify anything in particular so who knows, right? Took us to a dark place. She needs help so that these memories never trouble her again. Damn good writing, and you always veer off from what others might be seeing in the picture. With outstanding results, I might add. This one is dark, and you didn’t know you were going that way until those creative juices caught the wave and just went with it. The feeling you get is the seed of the idea you grow into being. And umm, I called it earlier with that Stephen King text! Because I just checked and that’s the result I got! To great story telling . . . It is dark and not my “as per” which is great when it works, which, according to y’all, does. And that is the coolest, ever. Stephanie King, I seem to recall… And that’s way too funny!! Ooooh, and R rating huh? Sounds intriguing. As do all of your story ideas. And then you cook ’em up and boom! Yes, it most certainly do. Does. Both! Yes! It was before I even looked it up too, so how about that?! Yep… I’ll have to tell you about it 😉 I dunno where this one came from, to tell the truth. Not knowing where it came from is equal parts cosmic and creativity. I didn’t say aboot, so please let the record state. . . The mythical aboot . . . there’s a post! Something that bad will never be truly forgotten but it sounds like she’s not going to let it destroy her. That is for sure. And no, she definitely is not. Awkward recollections make us sit up and wonder why things happened ion the past, why did we let it happen and then . . . a very appropriate story in our times. Thank you, James. This could be anything at all. And memories do that. They pop up when we are vulnerable. Too bad she had a bad experience. Memories have a strange way of coming back when someone is down. I am sure she will find a way to block it. Or just face it and move forward. Excellent in all its respects, but particularly for the way you leave it to the reader to fill in the details. Thank you, Crispina. I’m so very glad you think so. She might not have forgotten but she’s managing her life well. Well done. The beauty of the ceiling is a striking contrast to her memory. Maybe offering hope? I like that. So yes! Memories are like bad pennies–they keep coming back. Beautifully written. Easily could have been subtitled Me Too. You captured the feelings. Indeed. And her memory could be something totally different… but I like that it can be interpreted many ways. We do have a way of repressing those dark memories, but invariably the oftentimes resurface. I enjoyed the subtlety of your story and the ending where she determines to never let “that” happen to her again. Well-done! Excellent story, Dale. Simple, direct, insightful and with a most satisfying conclusion. Kudos! Thank you, Penny! So very glad you thought so! As for the premise, it was good and something we can all relate too. Buried memories always come back to haunt us. Thanks, Russell! No amount of rereading, sometimes… fixed. The past certainly has a way of coming back. Well written Dale! Thank you, Russell… that is does! You cleverly avoided telling what happened all those years ago that fostered those memories – perhaps you don’t know yourself! No matter how deeply traumatic memories are buried, they find a way to resurface even years later. A sad, sensitively written piece. A grim tale, for sure Dale, really well written as ever. If only we could erase traumatic memories. Well done, Dale. You outdid yourself! So many abuses covered up. Victims scared forever. Thanks. And yes. Way too many. Thank you so much. Whatever it was does not take away her essence.